A variety of glass crystals and natural elements are used to create individual works of art that are both personal and meaningful. 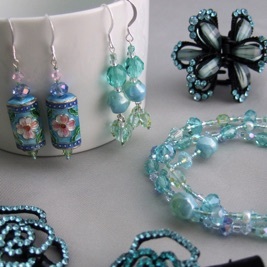 Each piece of jewelry is created with great attention to detail. If you’re looking for a unique pair of earrings, bracelet, necklace or even an anklet, you’ll be sure to find a new “must have” to add to your jewelry collection! Do you have an upcoming special event? Custom designed jewelry will add the finishing touch to complete your look.